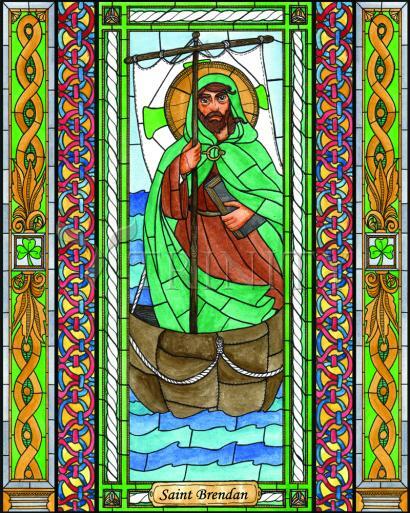 Saint Brendan was born in Tralee, County Kerry in 484 to parents named Finnlug and Cara. He was educated under Saint Ita and attended Saint Jarlath's monastery school at Tuam to further his education. Brendan is one of the "Twelve Apostles of Ireland", one of those said to have been tutored by the great teacher, Finnian of Clonard. Brendan was ordained a priest by Saint Erc and soon founded a number of monasteries in Ireland. Brendan was called by the sea and his first voyage took him to the Arran Islands, where he founded a monastery. He then sailed to Scotland, England, and France erecting monasteries as he went. Embarking in the name of the Trinity, Saint Brendan and 14 missionaries departed in search of the legendary Isle of the Blessed hoping to find the Garden of Eden. Many stories have been written about his travels both in Ireland and Europe. They tell of mysterious islands, sea serpents, natural phenomena and fantastical events as described in the ninth century Voyage of St. Brendan the Navigator. During his journey, he visited the Canary Islands and by some accounts may have even reached the shores of America! After a long life at sea, Saint Brendan returned to Ireland, he founded a monastery and a convent for his sister at Annaghdown, where he spent the rest of his days. This beautiful prayer is attributed to St. Brendan the Navigator (484-577 A.D.), also known as St. Brendan the Voyager, an ancient Irish monk, abbot, sailor, ship-builder, and explorer. He is the patron saint of mariners, sailors, travelers, and the U.S. Navy. His feast day is May 16th. It is believed by some historians that the holy abbot, eager to spread the Gospel to unknown lands, with the winds of the Holy Spirit in his sails, traveled by boat to North America—making him the very first explorer to set foot on her shores. Some say it was the legend of St. Brendan’s Voyage that prompted Christopher Columbus to launch his own attempt to discover the New World a thousand years later.